The cosmetics industry includes many disparities and meets ever more stringent requirements. Beauty, care, perfume, hygiene… our packaging solutions, ranging from filling machines, labellers, cappers and complete lines, offer all these sectors of activity reliable, efficient and adapted to cosmetic constraints. Product viscosity, packaging and container materials (flexible plastic, rigid plastic, PVC, etc.) are all variables to be taken into account for precise packaging. 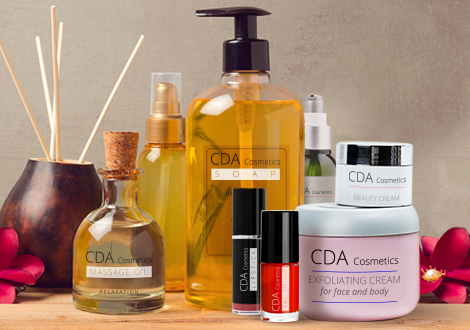 CDA offers a range dedicated to the cosmetics sector: pump systems adaptable to the viscosity of all products (cream, ointment, body oil, soap, essential oils, etc.) and labellers in various ways: on the top, on the bottom, the side, a wrap around label etc. Our machines allow us to respond as precisely as possible to the constraints of speed, precision, range evolution, product packaging as well as compatibility with existing equipment, or other. Our solutions comply with the brand image constraints conveyed by perfume bottles, cream jars and other shower gel bottles. A CDA semi-automatic labeller will allow you to label small productions in any format, more efficiently: small jars of cream, perfume bottles and other soap bottles while benefiting from accurate labelling that reflects your company’s brand image. Suitable for the cosmetics sector and all container formats, our machines allow the application of one or more labels on the side, the top but also the bottom of your products. Highly accurate, our automatic labellers ensure a high production rate for your medium and large productions. CDA develops semi-automatic filling machines equipped with different pumping systems, according to the viscosity of the product to be packaged, : peristaltic, piston or mass pump. A CDA semi-automatic filler is suitable for all types of products: liquid soaps, shampoos, creams, ointments, body oils, etc. By automating the packaging of your cosmetic production with a CDA automatic filling machine, you benefit from expert assistance in choosing the right machine for your products and from precision filling. Our filling machines can be equipped with different pumps and immersion nozzles to fill all kinds of liquids, even foamy ones. From labelling to filling, not to mention capping your bottles, jars or bottles, you are looking for a complete solution to pack your cosmetic products. CDA accompanies you on a project especially adapted to your products and your constraints, by a monobloc system or a complete line customised to your needs. CDA has also a whole range of complementary solutions that can be adapted to labelling or filling machines. From the small autonomous screwdriver to the loading/unloading table and conveyor belt, we manufacture everything that will optimize the packaging of your cosmetic products. The cosmetics sector is characterised by a great diversity of products. Beauty and care, perfume, hygiene, hair care, make-up… are all differences to be taken into account in order to provide a packaging solution that is truly adapted to this sector, which must demonstrate excellence in response to the high expectations of users in terms of quality, innovation, safety and attractiveness of packaging. Depending on the size of the company and the category of products manufactured, the packaging requirements for each production can be various: an evolutive machine for companies in full development, an ultra-compact machine for small sites, a complete chain for companies starting up their activity… CDA has developed a whole range of filling and labelling machines to meet the needs and demands of its customers specialized in the cosmetics sector. Aware of the challenges and specificities of the cosmetics industry, our team is committed to offering machines that meet all the expectations of perfume or various skin care manufacturers. Filling fluid, thick but also viscous, pasty or foamy products, precise dosing and labelling for millimetric and top-of-the-range packaging, screwing caps for products such as soap dispensers, labelling on different formats and shapes… CDA packaging respects the quality of your products. VSEs can acquire a semi-automatic labeller or filler to improve their performance and thus their productivity. These models are ultra-compact, on wheels, and easy to use and maintain. These filling and labelling machines perfectly meet the needs of small productions, both in terms of speed and quality of the packaging or dosage required. As for SMEs, a whole range of automatic filling and labelling machines perfectly meets new needs related to the launch of a new product, as well as the development of the activity (need to acquire packaging machines capable of a faster rate). In addition, the evolutionary nature of our machines allows us to expand our product range (shapes, materials) very easily. Large groups will also find the ideal solution to their packaging needs within the ranges of machines designed and manufactured in our premises in Narbonne. Our equipment can be integrated into existing packaging lines. Complete, tailor-made packaging lines can also be manufactured by CDA's design office to meet your specific filling, capping and labelling needs.